Even more absorbent and breathable than cotton, and more insulating as well, linen will keep you cooler and drier on warm nights and warmer on cold nights, too. We love its luscious drape and relaxed texture, and these sheets give those qualities free reign with stone washed fabric that feels wonderfully soft from day one. And true to linen's legendary durability, this bedding only gets better with time and laundering, serving you well in every season for years to come. Color-matched pick stitching lends subtle detail to the case cuffs and the flat sheet’s wide turnback. 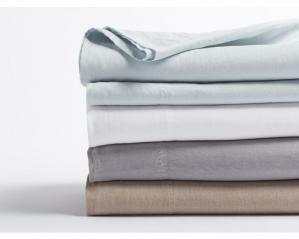 Set includes one flat sheet, one fitted sheet and two standard pillowcases (two King pillowcases for King set).